I always thought that endives are meant for salads only. 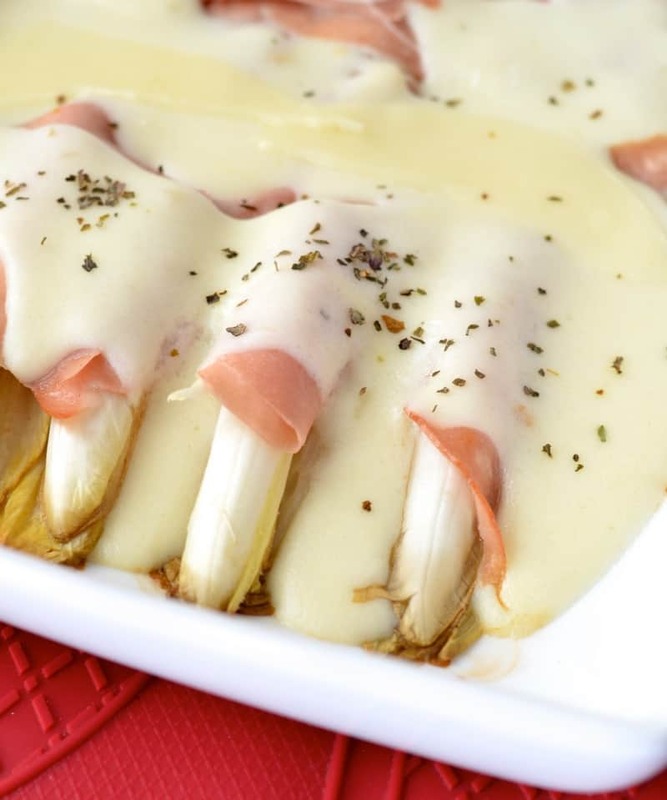 I have never tried any baked or cooked endives recipes until my friend made this delicious Endives and Ham Gratin recipe. I have to admit that I am not a fan of endives because of their bitter taste. But once I tasted this gratin, I could not help and cook it over and over. Besides, it is really quick to prepare and you know that I like when recipes are quick to make. Between all the extracurricular activities, weekend skiing and work, cooking is pushed down to my to do daily list. Recipes have to be really quick. 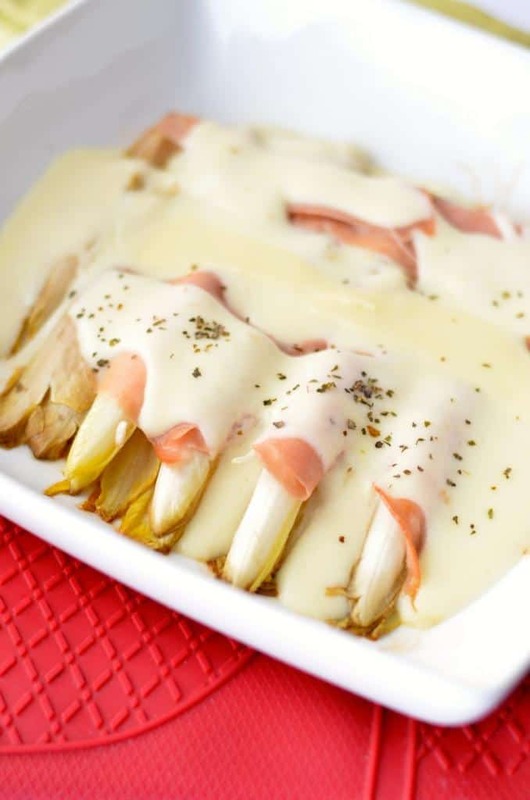 Affiliate links include in this endives recipe. 1 cup (250 ml) grated Gruyère cheese. 16 slices ham . You can use turkey or chicken. 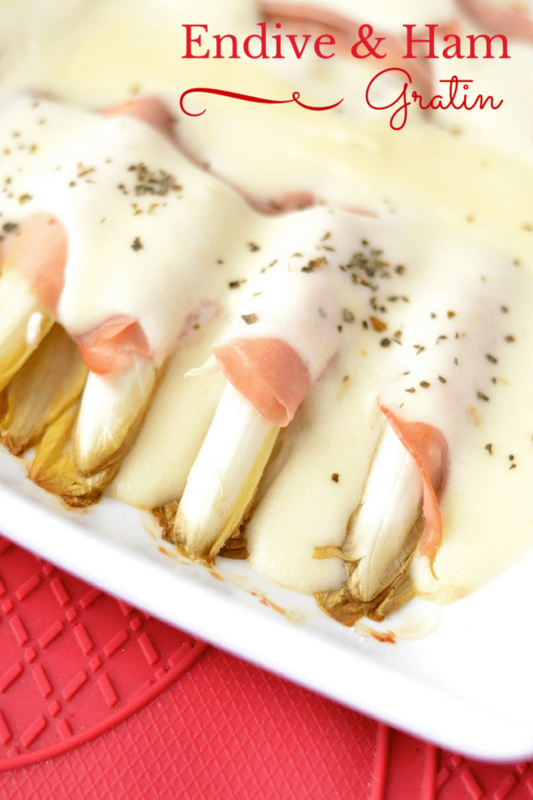 Once endives baked, add the ham slices and top with Bechamel sauce. It is best served as an appetizer for your holiday gathering. You can serve it with rice or grilled meat. As expected, the kids did not like the endive recipe. It was too newish for them and did not want to be adventurous. But they LOVED the Bechamel sauce with the ham. They almost fought over it. My daughter dipped her bread in the Bechamel sauce and added ham so it was like a sandwich. Next time, I think we’ll try it with homemade garlic bread! This sounds like a great way to use up that holiday ham! This sounds so delicious thanks for sharing this! My husband loves ham. I think I am confused between endives and chives. Thank you for coming to the Inspire Me Monday Linky Party on Monday. I’m Janice, one of your hostesses. I have never tried Endives before but this recipe might be a good way to try them out. Thanks for the recipe. I don’t think I’ve ever tried endive before, but I’m willing to try it out. Looks pretty tasty. The first time I ever heard of endive was last week on a Food Network challenge. This recipe looks so darn yummy! No, I’ve never tried them before, but I’m super curious. Looks amazing, I’ll have to give it a try! That looks delicious! I will have to make it for my family one night! I have never heard of Endives before. This recipe looks try worthy. This looks like a delicious recipe! Thanks for sharing! Something the entire family would love. 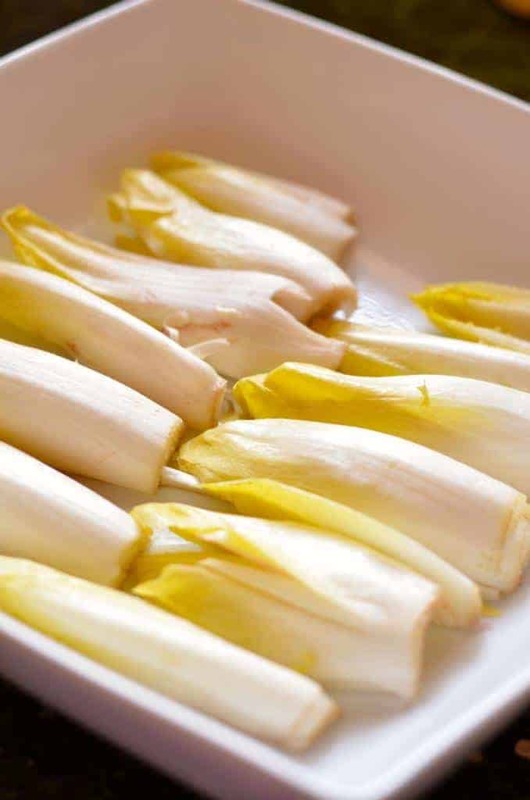 We would love to try this endive recipe. I’d love to give it a shot. It could be a new favorite! This looks like a delicious recipe. I will have to try it this weekend. I am sure my family will love it. I don’t think I have ever had endive. This looks delicious! Yum! This dish looks so delicious! I’ll have to try this. Ohhh, this looks absolutely delightful. I have to make these! What a great recipe! I have only ever paired endive with crab! I will have to try this! Oh this sounds like a dish my gma used to make and I loved it. I haven’t had endive forever. Thanks for the recipe. Ya know, I never have tried endives before. But this recipe makes me want to run out and get some right now. Yum! Well, now I’m super hungry! I can’t wait to give this a try. Thanks! Okay. Ham covered in a creme sauce might – MIGHT – get my man child of a husband to eat his veggies. Thanks a lot! Awwwww YEAH-UH! Ham wrapped around anything and covered in a creamy sauce is ALWAYS a winner. Sounds and looks dreamy! I can see why you want to make it over and over again. Will have to try to make this soon! I love endives! This is a great side dish. I can’t wait to make it for myself. I’ve never tried endives. I think I need to because this looks delish! That souinds SO good. I am definitely going to be making this SOON.